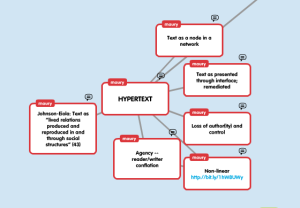 My MindMap itself is a good example of hypertext in that it moves across two-dimensional plane of the map as a visualization of the ideas I have had as a reader/writer, mapped over time and space, within the limits of the interface, and presented through it. You, as reader/writer, can visit my map and move through it at your discretion and order, choosing to click on links given to other sites or multimedia items as you like. Not everyone will interact with the text the same way, and that is simultaneously powerful and frightening, as the author/owner loses the ability to control how the information is presented and the reader/user may build new knowledge that is alternately or simultaneously empowering and disorienting. Conclusions drawn may be different from those intended and communication may break down. New ideas and innovations may be produced as well, leading to new texts. I turned the Popples red like Foucault on my map, as both are thematically talking about unities/disunities; the coming together of words and participants to create something that then dissolves. Both also are talking about an archaeologist or curator who makes (rhetorical) decisions. 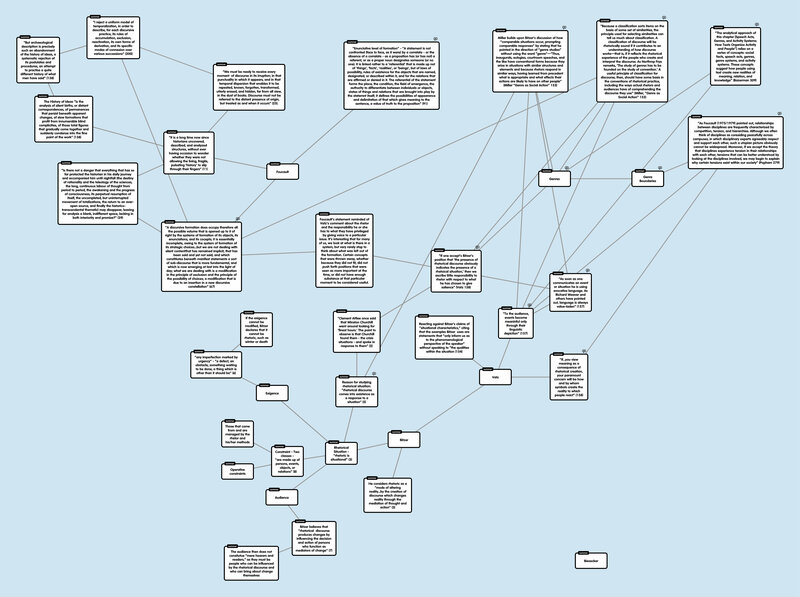 I also connected it to the Social Action node that I had added with Spinuzzi. Johnson-Eiola remarks that all decisions and texts are politically motivated and that the affordances and constraints of a given technology and utterance can be both empowering and disempowering simultaneously. Who benefits, how and why, and whether that should merely be noted or manipulated are all questions to ask. I also connect Hypertext to Biesecker, as I see it as playing out some of the same approaches to the rhetorical situation as she describes. I do not connect it to genre theory at this time. I am not of the opinion that hypertext is a genre. I believe it is a medium to display genres and move among and between them.